The Hillsboro First Baptist will celebrate its 175th anniversary on Sept. 30. The year was 1843. The first major wagon train was set to travel to the American Northwest via the Oregon Trail, and Mexico and the United States were on the verge of war over Texas. On June 9, 1838, 16 individuals had met under an apple tree at the home of Oliver Harris, located two miles east of New Market, for the purpose of officially organizing what was first called the Little Rocky Fork Baptist Church. In time, the congregation changed its name to New Market Baptist Church. As county seat, Hillsborough (as it was spelled then) had prospered and grown. At the same time, New Market had dwindled in size as many of its residents moved to the Highland County seat of justice, and many of those who moved from New Market to what is now Hillsboro were members of the Little Rocky Fork Baptist Church. Finding no Baptist congregation in their new hometown, 10 of those faithful followers began holding worship services in the home of Albert Wedge under the leadership of the Rev. Isaac K. Bronson. Deciding they could establish their own church, they officially organized their new congregation on April 14, 1843. On Sunday, Sept. 30, the community is invited to an open house from 2-5 p.m. as the church welcomes new pastor Clay Self and celebrates its 175th anniversary at 127 S. West St., Hillsboro. 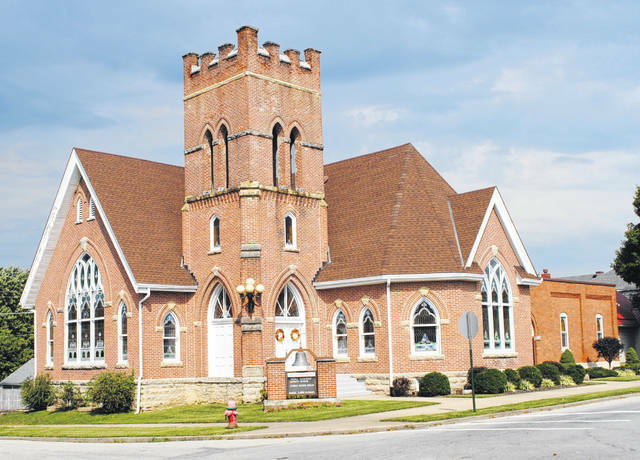 Not long after it was officially organized, the fledgling congregation received permission to use the Highland County Courthouse for services. Within a short time though, county officials closed the courthouse to such meetings and the growing congregation met at a school on East Main Street for the next few months. By then the membership had grown to the point where a permanent house of worship was needed. So in 1845, a city in-lot was purchased on the east side of South West Street. Not only had the 37 members given generously to the project, but others from the community did as well, including donations of bricks from prominent people such as Judge James Thompson, the husband of Temperance crusader “Mother” Eliza Jane Thompson, along with other substantial contributions from such noted men as General Joseph J. McDowell, Colonel Adam Miller and Governor Allen Trimble. A Greek-Revival style brick church building was erected. The First Baptist Church experienced many ups and downs in the following years, and in 1862, due to the Civil War, for the first time it found itself without a pastor. This persisted until about 1872 when with no leader and no regular worship services, the future looked bleak. But the story was really just beginning. In 1873, the church called the Rev. Gardner. Repairs and renovations to the physical structure were initiated, and in 1874 the church was rededicated to its mission. The turn of the century brought great blessings to membership growth and the present structure was built and dedicated in 1906. This time the structure was built on the northwest corner of South West and Walnut streets. Membership had grown to 149. The community of Hillsboro and First Baptist Church continued to have partnerships together and donations to the project continued, including a large No. 40 bell given by industrialist C.S. Bell. As the years passed there was continual growth of the membership, which led to more renovations as needed. A home was donated for the parsonage until a new one was built next to the church in 1952. Ten years later the basement of the church was renovated for full use, including classrooms and a fellowship hall with a kitchen. The church said in a news release that it has always felt God’s blessing upon it, yet there were various trials that challenged it. In 1977, lightning struck, causing a fire and great smoke damage at a cost of $80,000. Repairs were completed in 1978. Even today, updates continue to be made as needs arise. Information for this story was provided by Juanita Kelley, a longtime member and former clerk of the church. https://www.timesgazette.com/wp-content/uploads/sites/33/2018/09/web1_First-Baptist-Church-pic-pic-1.jpgThe Hillsboro First Baptist will celebrate its 175th anniversary on Sept. 30.